Timothy Youngblood, charged with murder in the July stabbing death of his father, Van Youngblood, was formally arraigned during a brief hearing Wednesday in Allen County Common Pleas Court. Pleas of not guilty were entered on Youngblood’s behalf to all charges contained in the indictment against him. LIMA — The attorney for a Lima man charged with murder in the stabbing death last month of his father entered pleas of not guilty on his client’s behalf during a brief arraignment hearing Wednesday. Timothy Youngblood, 31, of Lima, was indicted by the August term of an Allen County grand jury on two counts of murder, both unclassified felonies, and one count of felonious assault, a felony of the second degree. If convicted on either of the murder counts (he cannot be found guilty of both), Young faces a prison term of 15 years to life. Youngblood, 112 E. Market St., Lima, is charged in the July 9 death of his father, 65-year-old Van Youngblood, at the elder man’s residence at 311 E. 14th St. Initial reports from the Allen County Sheriff’s Office said the county dispatch center received a 911 emergency call at approximately 11:06 a.m. on July 9 about someone who had been severely injured. It was later learned the call was made by Wilma Youngblood, the wife of the victim. Deputies, along with personnel from the Perry Township EMS, responded to the East 14th Street home. A male — subsequently identified as the elder Youngblood — was pronounced dead at the scene. Police said the man had been stabbed “multiple times by a sword-like weapon” that was taken from a military style shadowbox display in the family home. Investigators said the glass had been broken and the sword removed from the display case. The Ohio Bureau of Criminal Investigation was called in to assist with the investigation and to aid in crime scene processing. 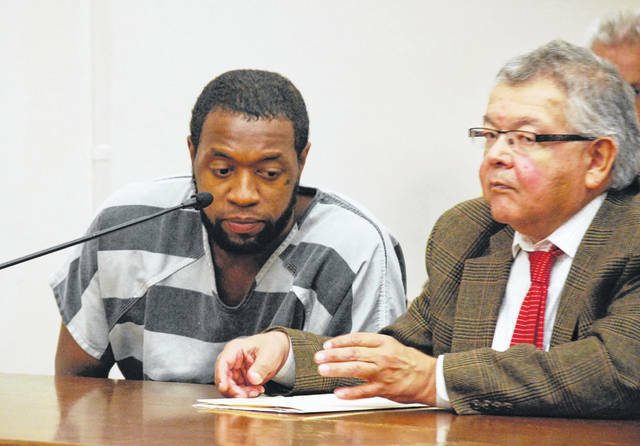 Youngblood appeared before Magistrate Richard Warren in Lima Municipal Court July 18 in a preliminary hearing and his attorney at that time questioned his client’s mental capacities and his competency to stand trial. On Aug. 8 Youngblood was ordered conveyed to the Northwest Ohio Psychiatric Hospital in Toledo for evaluation. He has been returned to the Allen County jail. Youngblood will return to court on Aug. 30 for an initial pre-trial hearing.